In addition to my video Self, I’m also working on a large scale wall drawing which draws on the images I’ve been taking of myself and is made up of hundreds of post-its. In order to make this work I applied a grid to the source image so that each individual post-it corresponds with a square in the grid (see below). The rationale for this was to scale-up my image easily, but also to make me systemically study my own face – to really see myself. It’s a work in progress and I’m yet to assemble the post-its to form my collective image. In thinking about other artists who employ grids to construct portraits, I started to think about the work of American artist, Chuck Close. Close has received international recognition for his large scale portraits and has been instrumental in reviving the art of portraiture as a credible subject matter. His signature style of portraiture has recently featured as the cover art for Paul Simon’s latest album – Stranger to Stranger, released in June of this year. Close’s own rationale for using grids to construct his paintings is as much pragmatic as it is stylistic. He is affected by a condition known as Prosopagnosia – a psychological condition which impairs ones ability to recognise faces in a normal human way. In 1988, the artist also sustained a spinal injury that left him largely paralyzed. In time, he regained movement in his hands and arms although he would wear a splint that would enable him to hold the paintbrush whilst using a mechanical easel in order to rotate the canvas (Art Factory, 2016). Whilst some critics may read these grid paintings as prescriptive in their construction, I myself have a lot of admiration for these works. Apart from his physical limitations, there is something truly innovative about Close’s appropriation of the grid. Each square seems so abstract in isolation; a myriad of spiralling colours, that suddenly form a unified image when one views the work from a distance. In this way, his work allows for multiple readings. 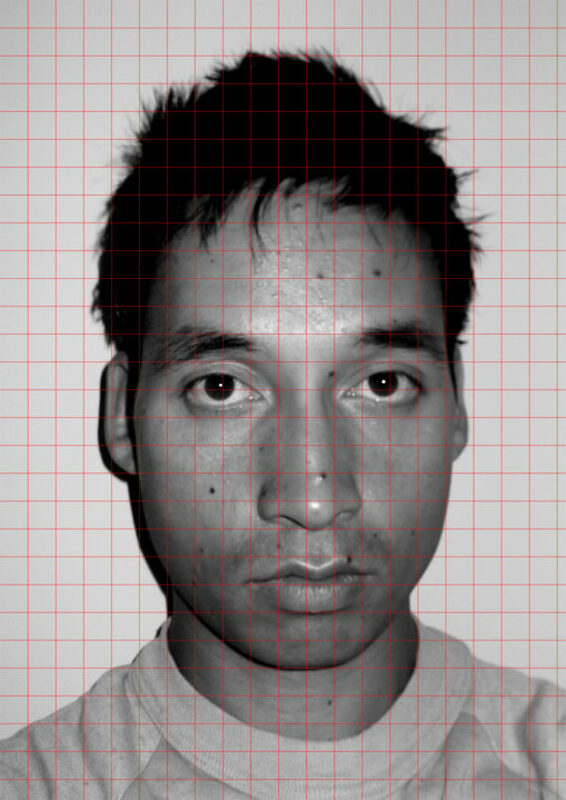 Close has often acknowledged that applying the grid to his paintings prevents him being overwhelmed by the whole (San Francisco Museum of Modern Art, 2012), a statement that perhaps validates my own use of a grid to draw my portrait. After all, knowing where to begin when making an artwork can be difficult at the best of times. How much more so when drawing one’s own face? Equally, I wonder how my personal feelings and insecurities about the way that I look might inform how I draw myself. Maybe using a grid will enable me to draw myself in a more objective way. In generating an image from post-it notes, I also like the idea that the final self-portrait will be obscured until all the individual parts are assembled together like a jigsaw. I have no idea what my completed self-portrait will look like; therein lies the motivation to push on. Within this process, I feel that there are also parallels to therapy – a broad notion of the ‘self’ being revealed over a period of time and under a certain degree of scrutiny. Close himself states he works very closely to his paintings, immersed in the detail of each square and actively chooses not to step back and survey how they fit together until the painting is finished (Nemser, 1970). Whether it’s a success or a failure, I’m looking forward to my own big reveal. Having missed the last meeting back in May, it was great to meet with the rest of the group and to have the opportunity to share new work. Meeting with a group of such proactive artists always leaves me encouraged to create rather than deflated by my own perceived idleness. Four artists attended the meeting: myself, Julie Turner, Sarah Arriagada and Anna Sikorska. Last year, I presented an image to the group that I’d given the working title of ‘Self’, a composite image made up of 100 individuals of my own self portrait that I’d resized and recoloured in Photoshop and laboriously layered one on top of the other. The image had also featured in this blog though I had struggled to know what to do with it. In recent months, I’ve found myself revisiting the image and reflecting upon my reasons for making it. Themes of self and identity have been well-excavated within the visual arts, namely in the art of portraiture. The dictionary definition of a portrait is a painting, drawing, photograph or engraving of a person, especially one depicting only the face or head and shoulders; a representation or impression of someone (Oxford University Press, 2016). In this way, a portrait claims to present a person’s appearance as well as their character. Although, whilst someone’s clothes, facial features, posture may contribute to a certain perception of that person, can they tell us anything about their true identity? Whilst visiting the Courtauld Gallery recently, I was struck by an artwork that seemed to sum up this disconnect between one’s self-image and their identity. Susan Hiller’s Midnight, Baker Street (1983) shows a series of three self-portraits taken in a photo booth at midnight – a liminal time between wakefulness and sleep, dream and reality (Leach & Fray-Smith, 2016). The images are presented as enlarged portraits, overlaid with scrawled notes (automatic writing) that is rooted in the unconscious mind. Hiller therefore is questioning how and whether a subject’s true identity can be visually presented (2016). Raising these ideas within the group, and showing the video of Self, we started to speculate on the limits of the self-portrait with a particular emphasis on photographic images. One idea under discussion was the potential for misrepresentation when having one’s photograph taken. For instance, photographs are static images, whereas we are animated and constantly changing, both in terms of our external appearance – the inevitable effects of aging, and in other underlying ways which may not be detected under the scrutiny of a camera’s lens. A reference was also made to head shots and the need to depict everything about one self in a small selection of images, perhaps even at the expense of other images which then become cast off or rejected. As Julie pointed out, taking an image of oneself can be quite ‘trapping’ as we may not feel that the resulting image is an adequate representation of who we are whilst we also don’t have any control over how the image will be received by others. Sarah also highlighted the importance of one’s gaze when taking a picture, which got me to think about my relationship with the camera when I was involved in this process. I explained that I often have a mirror set behind the camera’s view finder so I can change the angle of the camera or alter the tilt of my head and shoulders. The process is sort of an everyday ritual for me now; I’m often looking at my reflection in the viewfinder or the mirror rather than the camera itself. There isn’t really any emotional investment which perhaps comes across in my blank expression. Encouragingly, the video footage I generated for Self was well received by the rest of the group. Anna S, drew my attention to the term ‘palimpsest’, which means something reused or altered but still bearing visible traces of its earlier form. Showing the video also provided a springboard to talk about other interests related to this work. Most notably, the countless number of videos online which employ time-lapse photography to show changes in one’s personal appearance over a matter of months or years. These range from pregnancy videos or videos of people growing up or ageing to even more visceral variations showing people recovering from wounds, facial scars or surgical operations. Over the last few weeks I have become personally intrigued by these videos and the motivations for them being made in the first place. These videos, as well as my own, have a transient quality, which also point to the fleetingness of life itself (particularly in videos that depict the ageing process). Funnily, these ideas were picked up in the group with reference my own position as a father now, and the way that has altered my perception of my own mortality, both in terms of how I’ll be remembered and what I’ll leave behind. I’m also left wondering what has motivated to make my own variation of the time-lapse video and who is it for. Duct IV is featured as on the cover of the July issue of the International Journal of Art Therapy: Inscape. 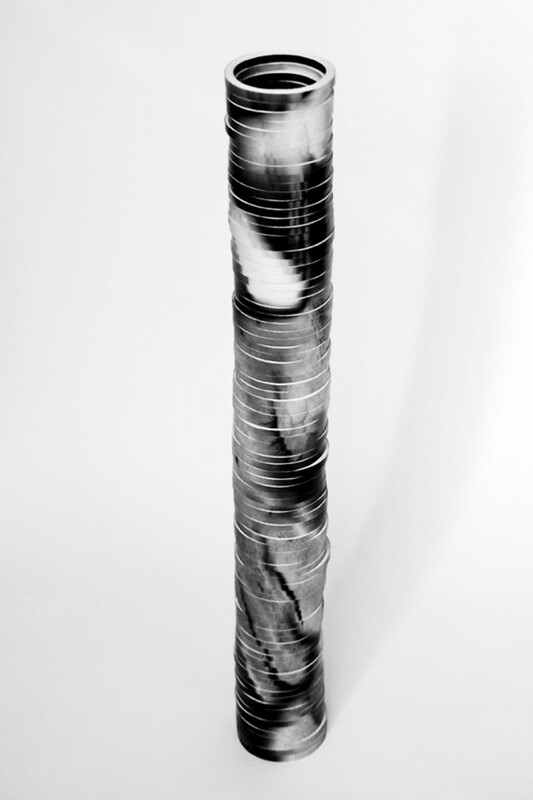 Duct IV is part of a series of works entitled Forms of Containment, a reference to the influential British psychoanalyst, Wilfred Bion. In a therapeutic context the term ‘containment’ describes the safe and holding environment that enables patients or clients to actively project their negative feelings onto the therapist so that they can then be contained, detoxified and given back to the client in a more manageable form (Edwards, 2004: 47). Duct IV looks to express something of the unstable, perilous nature of the therapeutic relationship; often both the client and the therapist are affected and changed in some way. I personally associate the rigour of the therapeutic process with the dynamic qualities of clay being shaped on a potter’s wheel. One might reshape or reframe one’s way of thinking as a result of effective therapeutic intervention. The image of clay being manipulated on a wheel is linked to my own understanding of therapy as a transformative, yet hazardous, process. Edwards, D., (2004), Art Therapy, London: SAGE Publications Ltd. I recently watched Artsnight, presented by the artist Ryan Gander, in which he spoke about the origins of creativity and the phenomenon of ‘positive jealousy’ that is a characteristic of conversations between artists sharing their ideas (2016). In Gander’s description, it’s when you see someone else’s art work and it actively inspires you to go back to your own studio or home to work harder at your own practice. Similarly, I would describe that within our own peer mentoring group, there is a lot of positive peer pressure in that we as individual artists are very good at gently nudging one another to try new things or persevere with others. For instance, we regularly recommend books or other texts to another, suggest exhibitions that we should go see or make timely connections between theory and practice that link our output as artists to our personal and professional experiences of therapy. It is also of encouragement to hear about others in the group applying to do the Art Therapy MA, having mentioned it in previous meetings, and then being able to weigh up the pros and cons amongst others who have already done the training. Having started the peer mentoring group in September, we’ve recently had our fourth meeting together. The turnout was smaller than usual – just three of us. Given the smallness of the group, we only had one artist presenting – Rachel Bayley, who brought a series of images detailing new work she had started developing about dolls, though she was uncertain about why she was making them and how she’d like to develop them further. Rachel’s work is often hand-made, evolving slowly, sometimes over many years. However, within the group, she spoke about how making work in this way can often be a frustration as the process doesn’t afford a lot of scope for experimentation and spontaneity. The alchemical process is usually marked by seven stages: calcination, dissolution, separation, conjunction, fermentation, distillation, coagulation. Whilst it is difficult to explain these various processes in any great detail here, it’s important to point out that alchemical transformation begins with calcination. This involves working with fire to burn away mental constructs and reveal a person’s true essence, a process of refinement. What interested me about Rachel’s work were the parallels with my own practice. Primarily, looking at these bulging figures reminded me of my own use of the body within a lot of my artwork, both in animated works and recent sculptural pieces. This sparked a lively discussion about the body as container – a topic that I often find myself returning to in this blog due to the connotations that containment has within the therapeutic encounter. In talking these ideas through I was reminded of an article called Second Skin by Esther Bick, a text that I had been introduced to whilst on my training. The article details the functions of the skin as a primary boundary and its importance in early object relations. Rachel was familiar with the paper, though talking about it made me want to re-read it because of its relevance to my own art making. What also interested me about Rachel’s work was the juxtaposition between taking a lot of time and care with something (i.e. making the dolls), only to subject them to destructive processes that they may not survive. There was a sense of ambivalence about these activities, especially as dolls are typically objects that are looked after and cared for. 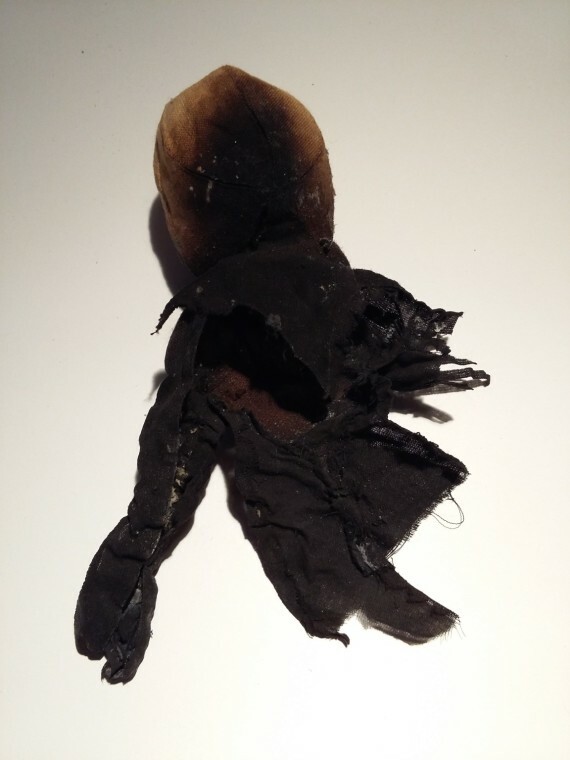 Sifting through her research, she also shared a fragment of text by Luce Irigaray which has fascinated her for years – about using a doll as an object to be exchanged between mother and daughter to remind them of their difference and separateness. Rachel also spoke about her doll collections growing up and how her relationship with these objects has changed as she has become older. In addition, I also shared with the group that I had recommitted myself to writing a dream journal. As yet I don’t know what use I’ll have for this journal, or whether it will translate to art making. I was however encouraged to look into social dreaming – a method by which dreams are voiced amongst large group of participants and expanded upon collectively through the free associations that others might have. Extrapolating the meanings of dreams in this way echoes ideas raised in my previous blog relating to Susan Hiller’s Dream Mapping artwork. Most recently, my inclination to dream, and to remember dream content, seems stifled. Perhaps this is a mental preoccupation with other things upon waking. However, in addition to social dreaming, I’m also left wondering what other factors may help or hinder one’s conception and recollection of dreams. Last month, I had the opportunity to go to the Wellcome Trust to see States of Mind: Tracing the Edges of Consciousness. I thought that attending this exhibition would aid my own art practice as it is often influenced by my preoccupation with the conscious and unconscious mind. Particular highlights of the exhibition included artistic explorations of the body/mind split and the theory of dualism – the conceptual division of something into two opposed or contrasted aspects. Historically, from a psychological perspective, the mind and body were thought to function separately, without interchange. We were given the opportunity to engage with artworks such as William Blake’s The Soul hovering over the Body reluctantly parting with Life, which I found particularly ominous and indicative of Blake’s own spirituality. It is interesting to consider how this division between the mind and body has been so disputed in the medical field that it raises serious ethical questions, such as how best to treat coma patients. I was also interested in how the exhibition explored how our brain activity increases, whilst asleep, even though our perception is largely reduced. As you can imagine, a large portion of the exhibit tackled the phenomenon of dreams. This ranged from folklores that try to offer a framework for where dreams come from, and what they mean, to sleep disorders such as sleep walking and sleep paralysis. Dreams have always fascinated me and during my studies I was encouraged to keep a dream journal, an initiative that was inspired by Jung. Jung was also a direct influence on many of the early art therapists as he acknowledged the capacity of image-making to link conscious and unconscious material. During his own self-analysis, Jung had drawn and painted his own visions and dreams and he encouraged his patients do to likewise (Storr, 1973: 115). In thinking about journalling my dreams I was also reminded of visual artists who have explored dream phenomena as a preoccupation within their own practice. 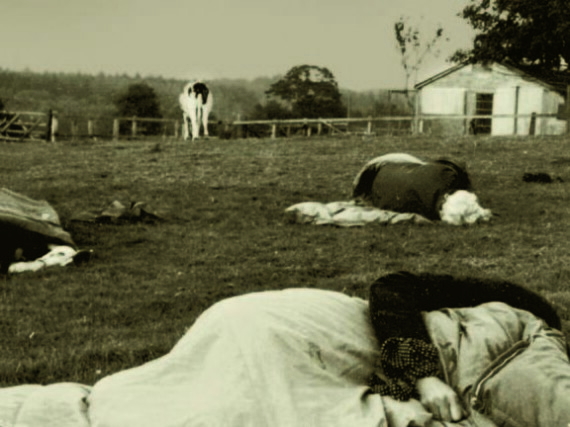 In Susan Hiller’s ‘Dream Mapping’ for example, the artist invited seven individuals to sleep for three nights inside “fairy rings” in an English meadow marked by an abundance of circles formed naturally by Marasmius oreades mushrooms, a landscape feature that occurs in a number of British folk myths (Hiller, 2012). The field became a site for dream experiences participants were encouraged to discuss and map their dreams the following morning. With this in mind, I feel encouraged to recommit myself to the discipline of journalling my own dreams – initially through written notes. Whilst I have done this previously, for short periods of time, I wonder what might be gleaned from making this a routine practice that I do every day for a year (or even longer).